Complete Game is happy to introduce our May Patient of the Month, Riley Magee. Riley came to us following "Tommy John" surgery on his elbow over a year ago. Through a lot of hard work Riley has returned to baseball at Northern Essex Community College. Riley has helped lead NECC to the National Junior College World Series in Tennessee. He won first team all region, regional gold glove at catcher, triple crown of region and regional player of the year this season. At Complete Game we were able to coordinate Riley's recovery with his coaches, instructors and trainers to help get him back safely and stronger than before. We are all proud of the coordinated team effort to get him back to peak condition. We can’t thank Riley enough for his kind words and the for the opportunity to work with him. With baseball season in full swing, I have heard a lot of talk recently about pitch counts, both in my clinic and at my son’s games. Most youth leagues at this point have adopted some form of pitch count parameters for players, but there is generally little explanation as to why it is important to follow them. It is important for parents to understand this issue, and essential if kids play on multiple teams as it will fall to the parent to watch the overall number of pitches a player is throwing and communicate clearly with coaches. Pitching more than 100 innings per calendar year has shown to leave players three times more likely to be injured. Averaging more than 80 pitches per game leaves players four times more likely to be injured. Pitching more than eight months out of the year leave players five times more likely to be injured. Pitching while fatigued has shown to increase risk for injury by 36 times! To help prevent overuse injuries, USA Baseball, along with MLB and the American Sports Medicine Institute, have come together to develop pitch count guidelines for youth baseball that recommend pitch count limits and how many days rest a pitcher should have before he pitches again. Many youth baseball leagues around the country have instituted these guidelines as rules on how many pitches can be thrown, but parents still need to pay attention. A recent survey asking about compliance with pitch count parameters in youth baseball showed that as many as 25% of coaches are not compliant with pitch count guidelines. Even when coaches are compliant with pitch counts for their league, they may not know if the pitcher has thrown in another league recently. Therefore, it’s important for parents to be aware of the pitch count guidelines, keep track of pitches for their player, and communicate clearly with coaches. Player size and how hard they throw. Generally speaking, the bigger the pitcher is and the harder he throws, the more stress is placed on the arm. It’s a good idea to keep these pitchers on the lower end of the pitch range. High stress innings. Not all pitches can be considered equal. Long innings where a lot of pitches are thrown are much more taxing on pitchers. If a pitcher starts the game off with a few very long innings, you may want to keep him on the low side of the suggested number of pitches. Other positions they move to after pitching. The overall volume of throws should be considered not just from the mound, but also in the field. Moving from pitching to positions where there are a lot of throws made, such as shortstop or especially catcher, increases injury risk. I hope these thoughts help parents understand why pitch counts have been established, the importance of following pitch counts for the youth pitcher, and some other factors that should be considered along with pitch counts. Managing youth pitching is certainly a challenge and, unfortunately, one that often falls into the hands of the parent. If we can work together as parents, coaches and medical professionals, however, we can help reduce injuries in young players and keep our kids healthy, having fun and on the field! Complete Game Physical Therapy is here to help. For more information or to make an appointment call us at 978-710-7204. Complete Game Physical Therapy is pleased to introduce our Patient of the Month, Mackenzie. Mackenzie is a high school freshman athlete who is both a softball and volleyball player and had labrum surgery . She saw Greg at the Nor'Easters facility for 2-3 months prior to the surgery when she had trouble throwing and came back again about 2 months after surgery. Now after four months, she is almost back to normal. Mackenzie, we are so glad you are pleased with your experience here at Complete Game. We loved working with you. Spring is here (or eventually will be here if you live in the Northeast!) and with it, inevitably, will be an influx of baseball and softball players with arm injuries coming into my physical therapy clinic. When I talk to these athletes, typically they tell me they do very little to take care of their throwing arms. Even at the youth level, athletes cannot simply jog out to their positions and play. It’s important for an athlete to properly train and prepare his or her body for the demands of the sport. Today I want to review what arm care is and offer some simple tips that your youth athlete can use to help reduce injury and improve performance. What is an arm care program? If you Google “arm care,” all kinds of band exercise routines and weighted ball programs will show up. Though these kinds of routines may be a component of a proper arm care program, a good routine should be more comprehensive than that. Proper arm care should include a preseason program, pregame warm up, in game routine, cool down, rest and recovery. It is unrealistic and even dangerous to expect athletes to be able to show up without preparing and participate in a highly repetitive throwing sport like baseball or softball. Athletes generally are throwing much harder at younger ages than they have in the past and this leads to increased injury rates. Athletes should participate in a preseason regimen that includes both a long toss program and a strengthening program for the muscles related to the throwing motion (the rotator cuff, scapula muscles, core and hips). You should work with a strength and conditioning specialist who is familiar with and, if possible, specializes in working with baseball and softball players. Playing other sports is also key as this helps keep your athlete in shape and improves overall athleticism. Pregame and practice is a time to get both your body and mind ready for the upcoming event. It should include a dynamic warm up for the whole body, possibly some band work for the muscles around the shoulder and elbow, and some long toss. Band work and long toss should be light, as athletes do not want to go in to a game or practice fatigued. Fatigue increases risk of injury by 36X. During the game or practice, a player should keep moving to stay loose. Baseball and softball are unique sports in that you may be standing for long periods and then suddenly need to sprint all out after the ball. Moving, even if it’s lightly bouncing in place, will help keep your muscles warm and loose. Be sure to keep moving in the dugout, too, as it’s easy to tighten up during long innings. Follow the new Pitchsmart guidelines for pitch count numbers which will help reduce the likelihood of overuse injuries. Pay attention to the overall volume of throws as well. Sometimes we count the actual pitches in the game, but don’t consider how much throwing an athlete is doing before and after he or she pitches. Postgame arm care should consist of light stretching and icing if the athlete finds it helpful. I am often asked about whether to ice or not. My personal opinion is that unless an athlete finds that it bothers his or her arm, why not? It’s easy to do and tends to help speed up the recovery process. Finding a good manual therapist who can perform soft tissue massage and stretching can also help that recovery process along. Proper arm care is a key component to keeping baseball and softball players healthy. It’s never too early to get your athlete on a good arm care program that will keep him or her on the field this season! Believe it or not, spring is here! And every spring, baseball and softball coaches and parents inevitably hear players say, “My arm hurts.” It’s a good idea, therefore, to educate yourself about arm injuries in throwing sports and about the dangers of trying to play through pain. Here are some tips to help you discern pain from soreness, some reasons why it’s important to avoid playing through pain, and some ways to address arm soreness. It’s not unusual for athletes to experience shoulder or elbow soreness after throwing. Common places to feel soreness are in the bicep (front of the arm), near the elbow or shoulder, in the tricep (back of the arm) near the elbow, and in the back of the shoulder (which is usually associated with the rotator cuff). Before a coach shuts down a player’s pitching or a parent calls the doctor, it’s important to talk with the athlete about what he/she is experiencing. Muscles feeling tired or tight. Soreness that loosens up with light stretching or activity. Soreness after the first few times throwing in the spring. Pain that is sharp in nature. Pain that worsens with activity. Symptoms that do not resolve after warming up. Pain changes everything. There are two primary reasons that playing through pain is a bad idea. First, pain often is a sign that something is seriously wrong. Pain can indicate injury to structures in the arm such as the UCL (the Tommy John ligament) of the elbow, rotator cuff of the shoulder, or growth plates in bones of the elbow or shoulder. Second, pain will alter motor control. It will diminish awareness of body position which can lead to not only decreased performance, but also to compensations which can result in injury in other areas. The American Sports Medicine Institute has developed guidelines to follow if your athlete is experiencing arm soreness with throwing. If sore more than one hour after throwing, or the next day, take one day off and repeat the most recent throwing program workout. If sore during warm up, but soreness is gone within the first 15 throws, repeat the previous workout. If shoulder or elbow becomes sore during this workout, stop and take two days off. Upon return to throwing, reduce number and intensity of throwing. If sore during warmup and soreness continues through the first 15 throws, stop throwing and take two days off. Upon return to throwing, reduce number and intensity of throwing. Shoulder soreness is a common occurrence in youth baseball and softball. Clear communication with the athlete is key to understanding exactly what is going on and what steps should be taken. I hope these tips help keep your athlete on the field and injury free. At Complete Game Physical Therapy located in Lowell, MA we specialize in the treatment of athletes and active individuals of all ages, particularly athletes that participate in overhead throwing sports. If you have any questions please contact us at 978-710-7204 or email at gcrossman@completegamept.com. Thank you, Bill! We enjoyed working with you, too! What is an Overhead Athlete? A parent asked me this question at the last Arm Care Seminar I gave at my clinic, Complete Game Physical Therapy in Lowell, MA. I love this kind of question because it makes me take a step back and think. Sometimes I get so caught up in the specifics of rehabilitation and injury prevention that I need to remember to pause and consider the overall picture of who we are working with and how these patients are differ from the general population. In this blog, I want to review what an overhead athlete is and how best to meet the unique demands of his or her training and rehab. An overhead athlete is defined in Webster’s Medical Dictionary as “one who uses their upper arm and shoulder in an arc over head to propel a ball toward the opposing team.” This includes throwing sports such as baseball and softball, but it also includes volleyball, tennis, and track and field throwing events. And though it doesn’t completely fit this definition, I would also include swimmers as overhead athletes. Shoulder health is obviously crucial for overhead athletes, so let’s briefly review shoulder mechanics and considerations here. 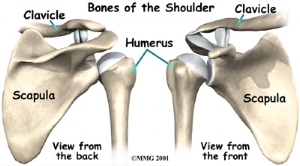 The shoulder is a ball and socket joint. The socket is not very deep so the shoulder doesn’t have a lot of boney stability (which is why we have so much mobility in the shoulder). An easy way to imagine the shoulder socket is to picture a golf ball on a tee. The shoulder gains it’s stability from the rotator cuff (the muscles that surround the ball) and the labrum (the tissue that makes the socket a little deeper). When all is balanced in the shoulder, the ball stays centered in the socket and everything works well. Problems arise when there is an imbalance around the shoulder and the ball gets off center in the socket. This imbalance can lead to shoulder pain, tendonitis, rotator cuff/labral tears, or even elbow problems as the athlete’s body tries to compensate. Here are a few considerations for keeping the overhead athlete healthy. It is not an all inclusive list, but just a few simple things you can do to help reduce the likelihood for injury. Posture: Watch your sitting and standing posture. If you have a slouched posture in which your shoulders round forward, the ball will sit forward in the socket. If you are doing this all day and then try to perform an overhead sport, it will be very difficult for the joint to center properly. Maintain good, upright posture with your head, shoulder and hip staying in line throughout the day. Muscle Balance: The muscles surrounding the shoulder are often out of balance. The muscles in front of the shoulder tend to be stronger than the muscles in the back. When you exercise, do extra work on pulling type exercises (rows) vs. pushing type exercise (presses) to help restore that balance. Using Your Whole Body: The shoulder can’t do it alone. If you try to rely on just your shoulder to generate power, you will surely get hurt. Perhaps you’ve heard a coach say, “Power comes from your legs.” This statement is true. Power is transferred through your core, so be sure to work your core and legs when you train or rehab. Also, make sure proper mechanics are in place so that you are transferring power effectively and efficiently. Simply, overhead athletes should train and rehab properly to meet the specific demands of their sport. If either you or your child is an overhead athlete, be sure your trainer or rehab professional has a thorough understanding of these concepts. Have a great season! At Complete Game Physical Therapy, ankle sprains are the most common acute injury suffered in sports that we see. In court sports such as volleyball and basketball ankle sprains have shown to account for up to 30% of time lost to injury. Field sports such as soccer, football and even baseball also have a high rate of ankle sprains. If you have an ankle sprain you should see a medical professional to get it taken care of as all too often people try to treat it with some rest and ice. This injury can become chronic and cause many problems down the road including achilles problems, knee injury, or even back issues. Below are some simple exercises you can use if you have a chronic history of ankle sprains or just want to avoid them in the first place. Keep your foot flat on the floor so your heel doesn’t come up and gently rock your knee forward. Ankle Eversion Against Towel- Most ankle sprains are on the outside or lateral ankle which can cause the muscles along the outside of the lower leg and ankle to become weak. A simple ankle eversion exercise using a towel as resistance can help strengthen these muscles back up. Hold the towel for resistance and gently push out against it with your foot. Think windshield wiper motion. Single Leg Balance- Balance can be compromised following ankle sprains. Basically, the message going from the foot to the brain on how the foot is positioned gets scrambled. Retraining your ankle simply requires working on single leg balance. Stand on one leg while lifting the other leg up so the thigh is parallel to the floor. If this is easy, try it with your eyes closed. If you currently have an ankle sprain or any other medical condition that will impact exercise, please consult your doctor or other medical professional before trying the exercises. Otherwise, these simple exercises can help reduce the after effects of ankle sprains whether you are an athlete, a former athlete or just trying to stay active. Complete Game is excited to introduce everyone to our Patient of The Month, Connor. Connor is a very active college freshman who attends Bryant University. He came to us after his second shoulder surgery...not one surgery on each side, but the second surgery on the same shoulder. The rehab process was extremely long and we had to wait a long time for healing to take place. The shoulder was very stiff and it took many sessions of work to get the mobility back. The good news: once mobility was back, we focused on strength and stability and he was soon back to full activity. Connor hopes to get back to track and field next season and with his determination and work we are sure he will! Inspired by Connor's recovery? Want to learn more? Complete Game Physical Therapy invites you to come see us at our new location at 1703 Middlesex Street in Lowell. With all the snow we’ve had so far this winter, it’s shaping up to be a great ski season. Once these freezing cold temperatures clear, lots of folks will be eager to head for the slopes. Every year, I see patients in physical therapy who have suffered ski related injury. You can help reduce the likelihood that you will be one of those who suffer a ski related injury this season with a few tips that will help you stay healthy and have fun on the slopes. Exercise. Skiing can be very strenuous, so preparing your body with some regular exercise can be helpful. Simple body weight squats, step ups or lunges are a good place to start. Always think about the alignment of your legs when doing these exercises. Keeping your toe, knee and hip in line as you squat or lunge will help reduce your likelihood of injury, particularly knee injury. Core work is also important. Planks are a great way to work core strength and stability. Biking is also helpful as it develops leg strength and builds endurance. Proper equipment and technique. Be sure that you have the right size skis and that your bindings are set at the right tension (also known as DIN). Your local ski shop tech (or, if you’re renting skis, a tech at the mountain) should help with this. It’s often a good idea to take a lesson too. Ski schools usually offer refreshers, quick one hour group classes, which are affordable and helpful if you haven’t been on skis for a while. Fatigue. Fatigue is a major contributor to injuries in all sports and it’s particularly problematic during the dreaded “last run” in skiing. Injuries on the last run are so prevalent that, often, skiers won’t even say the words “last run” because they think it’s bad luck. There are a few reasons for increased injuries at the end of the day. You are tired which leads to increased injury risk, ski conditions tend to be worse (especially in the east where it tends to get icey), and other skiers are tired so there is increased risk of collisions. Be extra careful at the end of your ski day. There is nothing better than spending a day on the slopes. These simple tips can help reduce the likelihood of injury and keep you carving turns all day long. Have a fun and healthy ski season this year! If you do experience an injury during your skiing day and need post-injury rehab, choose Complete Game Physical Therapy and we can have you back on the ski-lift in no time! Call us at 978-710-7204 for an appointment at our new location at 1703 Middlesex St. Lowell, MA 01851. If you’re like us, you’re wondering how 365 days could go by so fast! This was an incredibly busy year with milestones and new patients. Since it is almost time to turn the page to a new year, we are focused on what lies ahead and making 2018 as equally exciting as 2017. In 2017, we celebrated our first full year in business and saw over 180 new patients. We built great relationships with these patients as we helped them return to the sports and activities that they love and we are still in touch with many of them. We continue to have strong connections with area doctors, trainers and coaches which are all great referral sources for our patients. We work with many Youth Athletes and Youth Sports Organizations. We provided PT services and consulting for Boston Jr Rangers hockey program and provided free injury risk screening for many youth programs including Tewksbury Youth Softball, Nor’Easters Baseball, and Storm Lacrosse. We support many area sports programs including Tewksbury Youth Softball, Tewksbury High School Baseball, and Northern Essex Community College Baseball. Greg continues to grow as a resource in community by writing a health column in the Tewksbury Town Crier every other week. And most exciting of all…..we outgrew our current clinic! Our new location will be opening at 1703 Middlesex St, Lowell, MA. This new, larger space near the Merrimack River will have new equipment and is in a very convenient location that is accessible from routes 3 and 495. With our new Lowell location, we will continue to develop our relationship with Lowell Jr. Spinners Baseball and Mill City Volleyball. Being a great community supporter and attending events and establishing relationships with groups and organizations around Lowell. Our focus on reducing the likelihood of youth sports injury continues with our free injury risk assessments for area youth sports programs. We will also be continuing to develop our “Pitcher’s Arm Care Program” and “Annual Movement Check Up” programs. We want to thank you all for being a part of our success in 2017! There is so much more for Complete Game in the coming months! This month we couldn’t pick just one individual Patient of The Month, so we picked an entire team! I have provided PT services for their last season and I am working with them this season as well. The Boston Junior Rangers were established in 2008 and are based at Breakaway Ice Center in Tewksbury, Massachusetts. The team strives to compete in championships, but the main goal of the organization is to develop its players to their maximum potential. The young players on the team are in their late teens and early twenties and many go on to play at the collegiate level. With such passionate players, of course there will be time when strains and other injuries occur. I have been privileged to work with this team (and also The North Shore Vipers, which is a girls youth program team and the youth program for the Boston Junior Rangers) on the common injuries that occur in hockey. Ryan Blair, the Head of Hockey Development for the Junior Rangers, has been very pleased with the services. 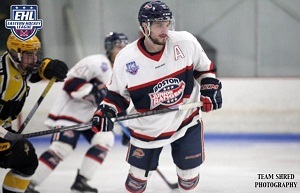 "Complete Game has helped out our Jr. hockey program a lot over the past year. Greg provides each player with his undivided attention and makes sure each players needs are met. Complete Game is a great and convenient way for our players to receive physical therapy. The quality of care is excellent and Greg has been great with our players." At Complete Game we love working with hockey players of all ages and we wish them luck on their upcoming season! Believe it or not summer is coming to an end and youth hockey season is already starting up. I know this past week I was in the hockey rink with other parents saying, “I can’t believe summer is over and we are already back here!” This season I’m helping out coaching my son’s team and, of course, my thoughts always go back to injury prevention strategies for the players. I’m going to discuss here warm up strategies for youth hockey. Injury prevention for hockey is huge topic and please refer to USA Hockey for more extensive information related to topics such as proper equipment, playing technique, etc. Here I wanted to give you 3 quick and easy things you could have your youth hockey player do before they get on the ice to help reduce their likelihood for injury. Hip and knee injuries are very common in the sport of ice hockey. Warm up exercises have shown to reduce injuries in other sports such as soccer, basketball and football. Yet hockey players tend to take the ice with little to no warm up. Being the parent of a youth hockey player myself I understand that the reality is most often you will be rushing to get your kid to the rink on time and the kids are crammed into tiny locker rooms with little space to get their equipment on never mind have room to warm up. With that in mind here are 3 easy moves any hockey player can do with limited time and space before taking the ice. This simple stretch will warm up the muscle in front of the hip, a common place for injury in hockey. Perform this 3 X for 20-30 second hold each side. 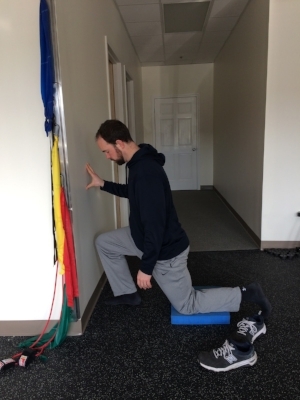 Another simple stretch that helps prep an area that is a common place for injury in hockey. Again this should be done 3 X for 20-30 seconds each side. This last exercise is a great one to both get increased blood flow to muscles but also work on a movement pattern that is very helpful to hockey. ‘When squatting the athlete should focus on keeping their hips, knees and feet in line and sit back into their hips. This can be done with skates on prior to going out on the ice. 2 sets of 8-12 repetitions should be performed. 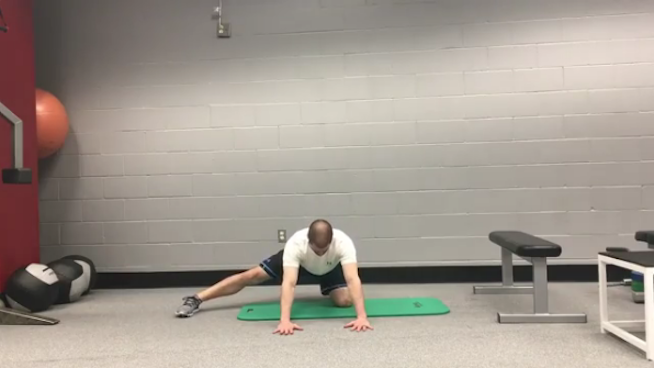 This is by no means a comprehensive warm up for ice hockey but these 3 simple moves can help both reduce the likelihood for injury and improve performance. Here’s to a healthy and fun hockey season for your youth athlete! Complete Game Physical Therapy is ready to help your student athlete with their PT needs. Give us a call at 978-710-7204 or email Greg at gcrossman@completegamept.com. Complete Game PT is happy to introduce our Patient of the Month for August, RJ. If you are looking for a different physical therapy experience, contact Greg today! As summer comes to an end and fall sports seasons are around the corner many youth athletes will be headed to their doctor to get their required pre participation sports physicals. Though requirements vary from state to state most states at this point require some form of physical before kids participate in school sports. These are very important in that they screen for cardiac, neuromuscular, or respiratory issues. A brief general musculoskeletal exam is also performed but this is limited by the physicians time constraints as well as limited space of a physician's exam room. The greatest risk factor for future injury is previous injury. If there is something we can do to help reduce the likelihood of injury in the first place we will be much more likely to prevent problems down the road. I have 2 young children who participate in sports myself and want to do whatever I can to protect them. Fortunately there is something we can do. Research-validated testing has shown to reduce injury rates in athletes of many different sports as well as the US military. A system such as Move2Perform that identifies and addresses side to side asymmetries as well as deficits with fundamental movement patterns is a great tool to help reduce the likelihood of injury for your youth athlete. Getting a more thorough musculoskeletal screen by a healthcare provider such as a physical therapist may not only help reduce the likelihood for injury for your athlete but also help improve their performance. As the saying goes “An ounce of prevention is worth a pound of cure” and though it may take some time out of your day for the testing you may save yourself time, money, and help keep your child safe in the long run. Complete Game PT is happy to introduce our July Patient of The Month: Sarah. 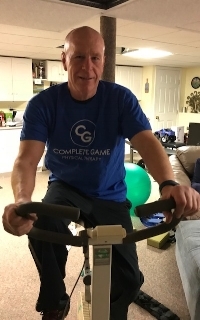 Sarah’s treatment here at Complete Game started with warming the shoulder with a heating pad and a massage.“Then I would do basic arm movements, each week building up more mobility and strength. I started PT without using any weights and then added weight as I gained strength. During my first PT session, I did simple hanging arm circles...and it hurt like crazy...but by my last session, I was doing push-ups with little pain,” Sarah explained. If you or your athlete are recovering from an injury or experiencing any discomfort or pain, give Complete Game Physical Therapy a call at 978-710-7204, email Greg at gcrossman@completegamept.com, or browse our website. Also check us out on Facebook and Twitter for more tips on staying injury-free. With summer baseball/softball leagues as well as Little League and Cal Ripken League tournaments going on, many youth ball players have shifted from league play to tournament play. Tournament play presents unique challenges to keeping athletes healthy as it is a format many players are not accustomed too. Coaches and players often feel more pressure to win. Having a child involved in tournament play myself and seeing some of the situations these kids are put in, I thought I would provide, based on the latest research, some things to watch out for that can lead to increased risk for injury. USA Baseball along with the MLB and American Sports Medicine Institute have teamed to develop pitch count guidelines for youth baseball (see chart below). These guidelines are based on extensive research and are widely considered the standard for youth baseball. You would think that these guidelines would be adopted in all youth tournament play, but unfortunately this is not the case. For example, see the pitch count regulations for Cal Ripken Baseball Tournament play below. As you can see from the 9-12 year old regulations, a pitcher is allowed up to 40 pitches with no rest days required and 75 pitches with only 2 days rest required. These tournaments often can go on for a week or more so you could be in a situation where your child is allowed to pitch up to 40 pitches on back-to-back-to- back-to-back days. This would never happen in the Major Leagues. How can it be permissible in youth baseball? A study in the American Journal of Sports Medicine in 2016 that looked at risk factors for “Tommy John” injury found that proper rest between pitching appearances can be just as important as following pitch counts. It is essential that parents and coaches are aware of this and make the right decisions for athletes. Though the pitch count guidelines above are helpful, there are factors that may reduce the number of pitches that should be thrown. Stressful Innings: not all innings are created equal. There is definitely a difference in stress on a pitcher's arm between times when they are cruising along and throwing free and easily, and when they are having tough innings when they have runners on base and are throwing 20 pitches or more in an inning. Hot Days: on particularly hot or humid days, pitchers are more likely to become fatigued (more on fatigue later) which can cause their mechanics to break down and leave them at increased risk for injury. Pitchers’ Physical Make Up: a pitcher’s size can relate to increased risk for injury in a way that may be counterintuitive to what you may think. A study in the medical journal Arthroscopy in 2015 showed that taller kids who throw harder are at increased risk for injury. It is recommended that coaches and parents are more careful with taller kids who throw harder. Pitching and Then Playing in the Field: Particularly in the younger levels of youth baseball, the pitcher tends to be one of the best athletes on the field. You will often see coaches take kids from the mound when they are done pitching and put them at shortstop, 3rd base or, worst of all, catcher. Be careful with this practice, as you have to take into account the overall volume of throws the athlete is making. The safest practice if you are going to keep the pitcher in the game when they are done on the mound is to move him to the right side of the field, 1st base, 2nd base or right field. Catcher: Though pitchers get much of the attention, catchers also are making a tremendous number of throws. Often catchers make many more throws than pitchers do in a given game and catchers may be asked to play multiple days in a row or even multiple games on one day. Care should taken as to the number of throws catchers are making and proper rest should be taken if catchers are starting to show signs of fatigue. Middle of the Field: A similar idea holds true with middle infielders and center fielders. Most of the action in the game is in the middle of the field so care should be taken, especially if playing multiple games in a day and multiple days in a row. Attention should be paid not only to throws made during play, but also warm up throws between innings. Fatigue and overuse have shown to be the two greatest factors for injury in youth baseball and softball players. A study by the American Sports Medicine Institute in 2006 found that pitching while fatigued increased likelihood for injury by 36x. I just want to repeat that: If a kid pitches while tired, he or she is 36x more likely to be injured! A nice study came out in the Journal of Strength and Conditioning Research in 2014 finding that the best indicators for fatigue are velocity and accuracy. A drop in velocity or loss of control is the best way to tell if a pitcher is fatigued. It’s crucial that a coach not only keep a close eye on the pitcher, but is also in close communication with the catcher about how the pitcher is looking. I understand how tournament play can lead to increased emphasis on winning. It is imperative, however, that coaches and parents keep things in perspective and don’t let a “in it to win it” attitude place players at risk. Following proper pitch count guidelines, paying attention to overall volume of throws in the field, and monitoring for signs of fatigue are a few ways that coaches and parents can help protect their players and help ensure that these athletes will enjoy the game for years to come. Because we love what we do and who we work with, at Complete Game PT we’ve decided to feature a Patient of the Month each month. June’s Patient of the Month is Kyle. Kyle came to Complete Game several months ago after suffering a back injury that occurred while he was swinging in baseball. Since working with Greg, Kyle has found his discomfort significantly decreased. Kyle is even back to playing baseball now, which he is thrilled about. “I’m playing baseball all the time. This past season went great, and now I’m starting up my summer team, so it’s going great.” Kyle remarked. Nearly everyone has had or will have a low back problem at some time in their life. Whether it’s a little discomfort or something more serious like a disc problem or a spinal fracture, the prevalence of lower back pain is astounding. The World Health Organization estimates that 60-70% of those in industrialized countries will experience non specific lower back pain in their lifetime, with that number rising. At Complete Game Physical Therapy, we see many patients with lower back pain - anyone from youth athletes to the older population. With that in mind, I thought I would review some of the common questions I get about lower back pain here. Should I just rest it? Bed rest used to be the common recommendation for cases of back pain. Recent research has shown us that this may not be the best option. The Clinical practice guidelines from the American College of Physicians now strongly recommends those with low back pain stay active. The same goes for the National Institute of Health whose recommendations are to return to daily activities as soon as possible and perform light stretching while avoiding movements that aggravate pain. Should I use ice or heat? This is a question I get all the time and the answer is really “it depends.” People’s bodies tend to react differently to ice or heat; some may tolerate heat really well and not ice, and for some it’s the other way around. I tend to tell people what ice and heat actually do and typically when each works best. Then they should try for themselves and see what works best for them. Heat is a vasodilator which will increase blood flow to the area. This is good to improve mobility but will also increase inflammation to the area. Heat tends to work best if you are feeling stiffness, in the morning and before exercise. Ice is a vasoconstrictor which will constrict the blood vessels and push blood and inflammation from the area. This will help reduce inflammation but also will increase stiffness in the area. Ice tends to be used best in the presence of pain, at night, and after exercise. 3.) What about “Icy Hot” or “Tiger Balm?” These are topical analgesics which can help temporarily reduce the pain but do not fix the underlying problem. These treatments will dull the superficial nerve endings that send pain signals to the brain and can be helpful to help you sleep or move a little better. These treatments should be only used temporarily while you are returning to your activities and working on what caused the problem in the first place. These are a few common questions I tend to get in the clinic relating to lower back pain and some strategies to help. If you are experiencing lower back pain, you should be evaluated by a qualified medical professional and set up on a treatment plan to help relieve your symptoms and get you back to the activities you love. At Complete Game Physical Therapy, we specialize in the treatment of athletes and active individuals with any musculoskeletal problem including lower back pain. If you need help, call us today at 978-710-7204. Because we love what we do and who we work with, at Complete Game PT we’ve decided to feature a Patient of the Month each month. May’s Patient of the Month is Jaryd. Of course, as every physical therapy patient knows, Jaryd has regular PT “homework.” Jaryd works independently at home on the exercises that Greg showed him during his visit, and does the exercises every other day. “My most important homework is not to re-tear my ACL!” Jaryd jokes.